You don't have to be wealthy or a business owner to benefit from hiring a tax accountant. You might feel that preparing your own taxes is just too time consuming, stressful, or confusing. Maybe your tax situation is complex or it's changed so you need specialized advice and tips. You might be facing problem, such as filing back taxes, paying off a tax debt, or fighting an IRS audit. And, of course, if you've started a business, invested in the stock market, bought a rental property, or moved outside the United States, you might definitely want some help come tax time. Finding the right professional for your needs doesn't have to be a challenge, but you'll want to make sure you don't overlook any considerations. Find a tax accountant who has experience dealing with tax situations similar to your own. You don't want someone who has never handled an audit before if you're being audited. Remember that you, not the accountant, are ultimately responsible for the information included on your tax return. Referrals are often your best bet. 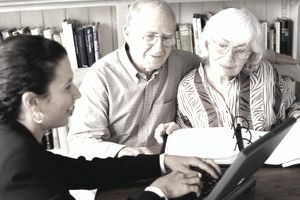 Ask everyone you can think of for recommendations: family, friends, business owners, financial advisors, and attorneys. Explain why you're looking for an accountant and what you want her to do for you. This will help them steer you in the right direction. Be wary of an accountant who promises you big refunds right from the start, or who that says you can deduct an excessive number of expenses—before even analyzing your personal financial situation. And don't be afraid to shop around or to change accountants if you aren't satisfied or comfortable with the service you're receiving. Local, independent firms often specialize in the tax needs of individuals and small businesses, but ask if the firm has the expertise to handle your taxes if there's anything unique about your situation. What About All Those Retail Franchises? Retail tax franchises such as H&R Block, Jackson Hewitt, and Liberty Tax Service offer competent help if you just want to file a relatively straightforward tax return. You can sometimes even find certified public accountants and enrolled agents working in these offices. Ask if you can meet with a certified public accountant (CPA), an enrolled agent (EA), or a senior tax preparer. You'll usually pay the same price, but you'll get to work with a more seasoned professional. EAs have passed rigorous testing and background checks administered by the IRS. They often specialize in certain tax areas and they're best for complex tax situations. They can represent you before the IRS if you're dealing with an audit or collections. CPAs have passed the rigorous CPA exam and they're licensed by the state in which they work. They often specialize in areas specific to accounting. Some CPAs specialize in tax accounting, but not all CPAs handle tax issues. A CPA can also represent you before the IRS if you're dealing with an audit or collections. Tax attorneys are lawyers who specialize in tax law. They often have master of law degrees in taxation, in addition to the required juris doctor degree. Attorneys are best at complex legal matters such as preparing estate tax returns or taking your case before the U.S. Tax Court. You don't want commit your personal business to anyone you don't know, so meet with the professional first to discuss your situation and to ask some questions, even if you have to do it over the phone. Request references, just as you would from anyone you're thinking of hiring—and reach out to those references. Keep in mind that not everyone will feel comfortable talking to you, and keep it simple: "Are you pleased with his services?" "Ever have a problem with her?" The answers to these questions can tell you a lot, especially if you shut up after asking and let the other individual state whatever comes to mind. Tax professionals are subject to various federal and state regulations, so asking the right questions can help ensure that you find someone who's experienced and trustworthy. Do you believe that I'm paying too much, too little, or just the right amount of tax? Perform a quick background check after your interview. You might even search for the professional's name in social media. Find out what's out there, what he says on his own site, and what others say about him. Contact your state's board of accountancy to check the status of a CPA's license or to find out if any disciplinary action has ever been taken against her. You can ask the IRS Office of Professional Responsibility if an EA has been censured, disbarred, or subjected to other disciplinary action. You might also want to check with your local chamber of commerce.